SinFest 3 Heavy Metal Culture Festival | Badass Concert | Heavy Metal Music News | So METAL, we piss RUST! It’s that time of year again, time to get your free keg beer on and enjoy some awesome heavy metal bands. The man behind the exciting mayhem is Bailey Kvamme and just like before, there is no stopping this heavy metal festival train. Bailey has been the director of the SinFest project and event coordinator. Every year SinFest packs The Depot with people who want the best in local metal. You will not wanna miss this beer drinking, headbanging, puke until you drop crush fest! SinFest 3 features five heavy metal bands and guest artist exhibitions. Back to headline this beast is Sin/Fixx from Norfolk, Nebraska. Sin/Fixx has a talent, and that talent is bringing the party and killing it. Festival newcomers this year are Valiska from Council Bluffs, Iowa. Can’t wait to see what they have in store! The brutal crushing force Architect Or Arsonist are back. Holy s*** are these f**kers heavy! AOA will leave a stain on your soul and you’ll want more. Heavy metal viking legends Primal Waters are back on the scene. Have they found a replacement bass player? We’ll find out! Primal Waters released their new album earlier this year in March and the reviews are excellent, so you cannot go wrong with these dudes! Last but not least, we have SinFest newcomer Johnny Legion. JL offers a fresh prospective on the heavy metal scene with a mixture of good rock n’ roll. JL puts on one hell of rock show; it’s gonna be rad. Dillon’s Diabolical Designs will be on the scene with an exciting new exhibition for you crazy concert goers to feast your eyes on. Artwork will be for sale, along with t-shirts and more. 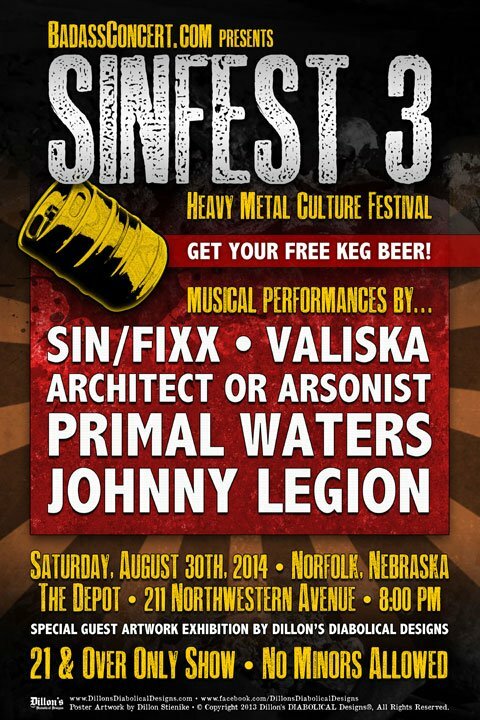 The sweet action of SinFest 3 starts at 8:00 PM on Saturday, August 30th, 2014. The venue is the historic Depot, located in Norfolk, Nebraska. This is a 21 & over show, so NO MINORS allowed. Stick around and bookmark BadassConcert.com. Like us, follow us… whatever on your favorite social networks. Finally head over to Crank It Up Radio and enjoy. Next articleInterview with Mike “Metal” Mayer of Sin/Fixx! I'm not here to be your friend. I'm not here to tell you how to live. I'm here to bring you badass headbanging news!